From camping at Aru Valley to golfing at Pahalgam Golf Course - Pahalgam is a traveller's delight. Pahalgam, located about 95km from Srinagar, is perched at a height of 7,200 feet. It’s perhaps one of the most scenic places in the whole of Kashmir; courtesy the thick lush pine backwoods and the stunning vistas of knolls and snow-clad Himalayan peaks. Right at the intersection of Lidder river and Sheshnag Lake, Pahalgam offers some of the most thrilling water activities. Lovingly, also known as the ‘Valley of Shepherds’, this hill station is best visited between the months of March to November. Though Pahalgam serves as a base camp for the Amarnath Yatra, it’s not just known as a pilgrimage site; there’s mush to see and do here. Tulian Lake – one of the top attractions – is this beautiful clear lake in the middle of the mountains. It’s a tough trek (15km) from Pahalgam till here or you can also take a horse ride. 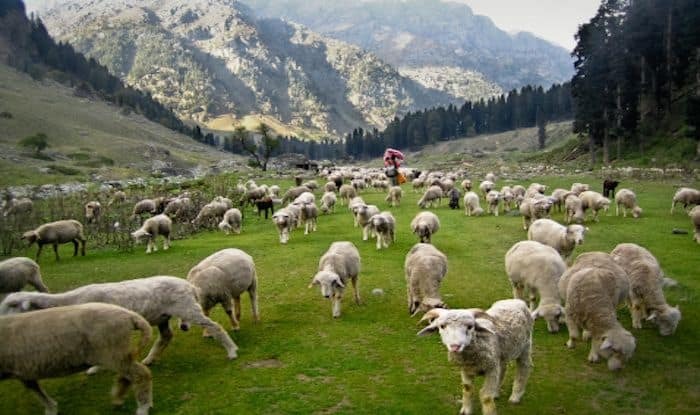 Another popular place amongst trekkers, Betaab Valley too is situated about 15km from Pahalgam and falls en route to the Amarnath Temple Yatra. The water of this valley is so pure and clear that it’s used for drinking. It is a perfect spot for simple afternoon picnics. Among the temples here, the Sun Temple is a must visit because it’s an integral part of the history and heritage of the area. Situated on a plateau, the temple is well known for the carvings on the walls and majestic views of the surrounding areas. Mamaleshwar Temple, known to be one of the oldest in Pahalgam, is built by the banks of river Lidder. The temple is dedicated to Lord Shiva and is just 1km away from Pahalgam. You can visit this temple on foot for an immersive experience. Aru Valley may seem like just another snow-covered meadow but the highlight of this place is the local culture and traditional way of living that you can experience first hand. From indigenous souvenir shopping to admiring the way local houses are made, a visit here will make you see Pahalgam in a different light. The drive from Pahalgam to Aru Valley is spectacular; with pine trees and waterfalls dotting the way. Whether it’s golfing, photography or a tryst with nature, Pahalgam Golf Course is your answer. Set amidst picturesque surroundings and gorgeous vistas, a game or two of gold at this well-maintained 18-hole course will stay with you forever.